Pasteurization of milk destroys the bacteria that cause tuberculosis and undulate fever. In the process, named after the French scientist Louis Pasteur, the milk is heated to 62–71° (144–160°F), which is lethal to most bacteria but not high enough to alter the quality of the milk. As fewer cows carry infectious disease, pasteurization's main use is in improving the keeping qualities of milk..
Pasteurization is a process of applying heat to food and various drinks in order to destroy disease-causing organisms (such as some bacteria) and to reduce the numbers of bacteria and fungi that cause food to decay, thus allowing it to be kept for a longer period of time. The process is named after the great French scientist Louis Pasteur. It was developed after his work on the souring of wine and beer had shown that heating them to a temperature of about 54.4°C (130°F) for a short time delayed souring. Pasteurization is a much less severe process than sterilization, the purpose of which is to kill all germs, since it destroys only a small percentage of the food value and hardly affects the flavor of the food. 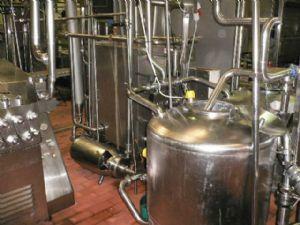 Much higher temperatures are obtained in sterilization than in pasteurization. Canned meat, vegetables, and milk are sterilized at temperatures of 115.5°–121.1°C (240°–250°F) whereas the temperature at which milk, for example, is pasteurized by the HTST method (described below) is typically only 71.7°C (161°F). Eighty percent of a food's vitamin C content is lost merely by boiling it for twenty minutes and at 120°C vitamin B1 is destroyed. Milk when it is pasteurized loses only ten percent of its vitamin B1 and only 20 percent of its vitamin C.
The best known use of pasteurization is in the preparation of milk. In one of the commonest methods it consists of heating the milk to 71.7°C (161°F), a temperature below its boiling point, for a definite length of time, followed by immediate and rapid cooling. The heat treatment destroys all the disease-causing bacteria that may be in the milk and at the same time reduces the number of bacteria which cause milk to go sour so that its keeping quality is greatly increased. Milky was first pasteurized toward the end of the 19th century. It was then used solely to prevent the milk from souring so quickly. Later, however, it was realized that harmful germs could also be killed if the process were modified. It was found that in order to kill certain germs (e.g. especially the tuberculosis bacillus that causes tuberculosis – a disease of the lungs that caused many deaths in the eighteenth and nineteenth centuries and the early part of the 20th century) it was necessary to hold the temperature of the milk at approximately 62.8°C (145°F) for nearly half an hour. A process using this method is called the holder process. The holder process is uneconomic on a large scale, however, because it takes too long and too large a plant is required. Most milk is now pasteurized at higher temperatures in the so-called HTST (higher temperature, short-time) method or UHT (ultra-high temperature) method. In one form of the HTST method, the milk is retained at a temperature of 71.7°C (161°F) for 15 seconds. This is sufficient to kill the disease-causing bacteria, including the tuberculosis bacillus, and most of the bacteria which cause souring. The milk is the cooled rapidly to below 10°C (50°F). If the milk were allowed to cool slowly conditions would encourage the growth again of the milk-souring bacteria and so rapid souring would take place. The cold incoming milk is first heated by the hot outgoing pasteurized milk as the latter passes from the holding tube through the regenerator. The pasteurized milk loses heat to the cold milk and thus is itself partly cooled. The warmed incoming milk is then heated by hot water in the heater to 71.7°C (161°F). Its temperature is carefully maintained so that it enters the holding tube at 71.7°C. The milk takes only 15 seconds to pass through the holding tube its temperature remaining at 71.7°C during this time. 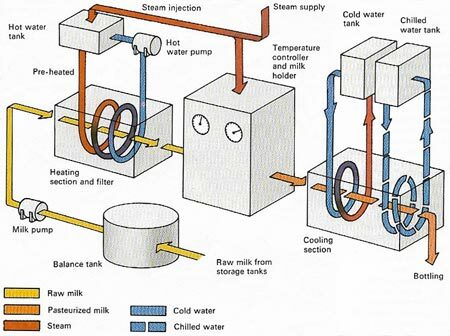 It then passes to the regenerator where it heats more incoming cold milk (itself being slightly cooled) and is piped to the cooler in which it is cooled by brine or chilled water to 4.4°–7.2°C (40°–45°F). A safety device, the flow diversion valve, automatically opens if the temperature of the milk at the end of the holding period is below 71.7°C (161°F) and the milk is returned to the heating section. When the required temperature is regained the valve closes and the pasteurized milk passes to the regenerator. Freshly pasteurized milk is immediately filled into containers, which have been thoroughly sterilized before hand to prevent the milk from being reinfected with bacteria. In the UHT method the milk is held at the much higher temperature of 138°C (250°F) for a fraction of a second. Milk labeled simply "pasteurized" is usually prepared with the HTST method, whereas milk labeled "ultra-pasteurized" or "UHT" must be treated with the UHT method.